The modular storage system Built to meet your needs. 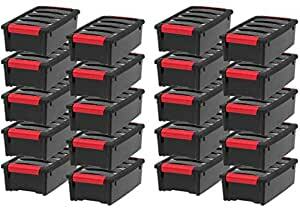 These durable 5 Qtr stack & pull storage boxes easily store hardware, tools, office supplies, and more. Buckle up latches keep the lid securely in place, and the built-in handle makes it easy to pull the plastic storage box off of a shelf. Stacks neatly with other units in the stack & pull Series. Made in the USA. I bought these to help organize my sewing room, and they’re perfect for smaller projects. Two stack perfectly inside an IKEA Kallax cubbyhole. Great quality. Love the snap lids. I read some negative reviews so i was nervous but I have not had a problem at all. Has helped me organize my move so much that I am ordering more! Stackable and great to see what’s inside without having to open up and shuffle through. Excellent product at a reasonable price. Arrived with the handles broken off three. Handles broke off two more — that’s a fifty percent failure rate The plastic is so brittle that just the slightest amount of torsion or twisting will break the translucent plastic completely. Finally found the perfect size boxes for my husband’s shoes. Love the fact that they are clear. I have taken pictures of each pair of shoes, printed them off on regular printer paper and taped the pic on the inside of each box. No more dust on shoes that are not worn on a regular basis and they are easy to find when he wants them! Love the size and the way the boxes stack, but I HATE that the gray handle closures pop off all the time. You can’t fold them back all the way or they pop off. If you plan on opening and closing the boxes a lot, I wouldn’t recommend this product. It’s fine for long term storage, but not for frequent use. Bought these thinking they were the same product as purchased at Costco but they were out of stock. Description/measurements the same, but these are more cheaply made – thinner, more brittle plastic and snap locks easily come out/break from the box. A hassle to return too since arrived in big box. Am hoping that Costco has these stocked again, although the snap lids are still fragile. These are very practical for home hardware storage especially if you are a DIY kind of guy/gal. I use about 18 of them in my garage separated into things like “electrical”, “plumbing parts”, “sandpapers”, “glues”, “tapes”, etc. They stack well and keep the contents clean. The transparent quality allows you to see through to the contents. Well-enough made to last without breaking the bank. I bought 2 sets of storage containers, these being one of them. These are far superior to the others that I have purchased. I use them to organize my crafts, electronics, army patches/pins, etc. They sit in my closet stacked up for the most part, so as far as every day use, I don’t know how they hold up. The handles lock on and fit well. They seem to be pretty hardy plastic. I recommend them.